Charlie saw this recipe in the New York Times on November 8, 2006. That recipe is for white flour bread. The recipe below include modifications Charlie has made to use whole wheat flour, add nuts, etc. He's made it many many times now. It is amazing, easy, and seems to be foolproof. It's as good as, maybe better than, any bread we've ever eaten, even in Europe. Here's the New York Times article The Secret of Great Bread: Let Time Do the Work and the New York Times recipe. Here's a blog where someone is raving about the recipe. 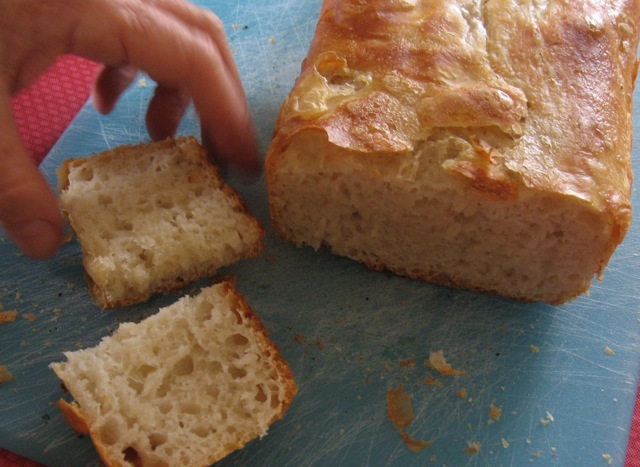 The picture looks exactly like Charlie's (except Charlie has started making his in rectangular loaf pans). The recipe below works well in mile-high and dry Albuquerque. Might need adjustments for other altitudes, humidities. 3 cups flour: unbleached white flour or mixture of whole wheat bread flour and unbleached white flour. We find 100% whole wheat bread flour is too heavy. Half whole wheat and half white works well. 1-5/8 to 1-7/8 cups water (1-5/8 for white flour, 1-7/8 for whole wheat). Should be at room temperature or maybe a little warmer. Stir together flour, yeast, and salt in large bowl. Add water and mix well with a spoon. Optional: Stir in variation ingredients (see below). Cover with plastic wrap and let sit in a place that stays at least 70 degrees. After 18 hours (or 12 to 24, close to 18 is best), move the dough to a floured board. Use enough flour so it doesn't stick. Fold once or twice so it is not so spread out. Use flour so you can handle the dough, which will be wet and sticky. Whole wheat flour works best here even for white bread. Corn meal also works well. Cover again with the plastic wrap and let the dough rest for 15 minutes. After the dough has rested 15 minutes, move it to the bread pan. The dough will be sticky; use a spatula to get it out of the bowl. Cover with a cloth and let rise for two hours. The white bread rises a lot but we have found that the whole wheat version does not rise quite as much and the resulting bread is a little heavier but still very good. After the bread has risen for two hours, cover with foil and bake for 45 minutes in an oven preheated to 450 degrees, removing the foil after 30 minutes. Stir in 1-1/2 cup chopped walnuts and 1-1/2 cup raisins or craisins or chocolate chips. It's sooo good!! We figure it's a little less fattening than chocolate chip cookies.